Summary of the law on race discrimination. 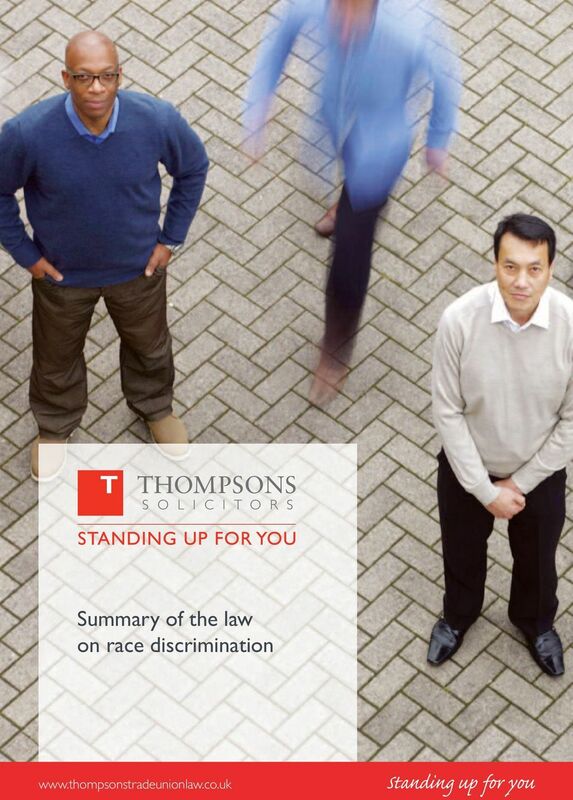 Download "Summary of the law on race discrimination. 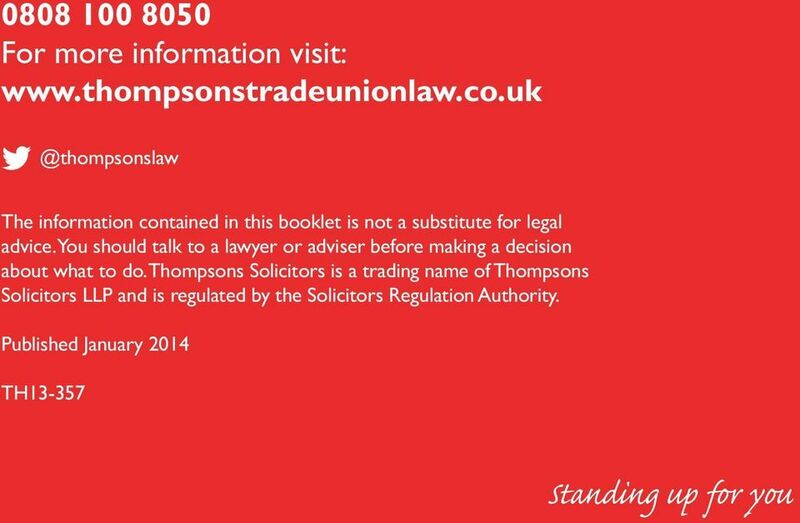 www.thompsonstradeunionlaw.co.uk"
5 Summary of the law on race discrimination 5 About this booklet This booklet sets out the basic employment rights to which workers are entitled under the race discrimination provisions of the Equality Act These apply in England, Wales and Scotland (except where indicated) only. Protection and liability. Discrimination. Harassment. Victimisation. Exceptions. Tribunal claims. Remedies. 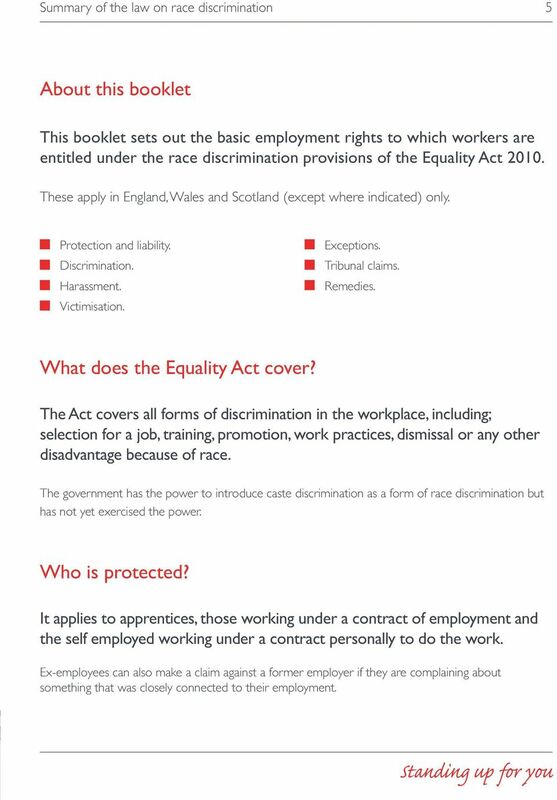 What does the Equality Act cover? The Act covers all forms of discrimination in the workplace, including; selection for a job, training, promotion, work practices, dismissal or any other disadvantage because of race. The government has the power to introduce caste discrimination as a form of race discrimination but has not yet exercised the power. Who is protected? It applies to apprentices, those working under a contract of employment and the self employed working under a contract personally to do the work. Ex-employees can also make a claim against a former employer if they are complaining about something that was closely connected to their employment. 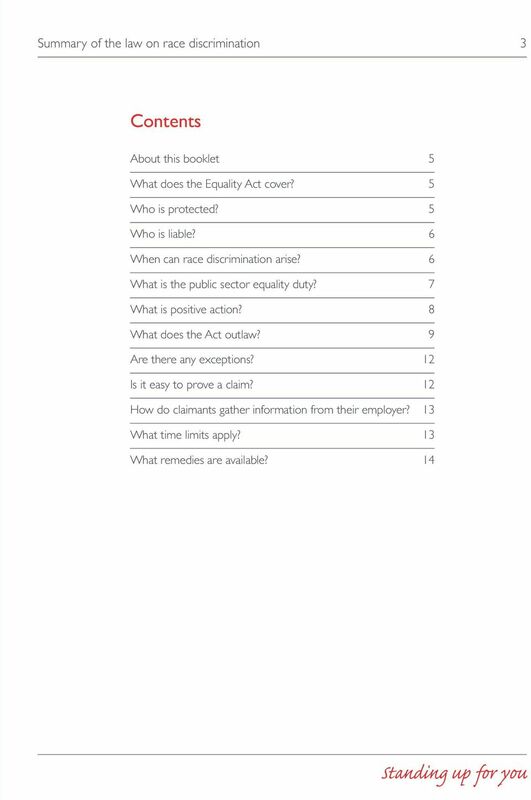 7 Summary of the law on race discrimination 7 What is the public sector equality duty? Public bodies such as local government, the NHS and those carrying out public functions are under a duty to consider equality when making day-to-day decisions both in terms of service delivery and employment. 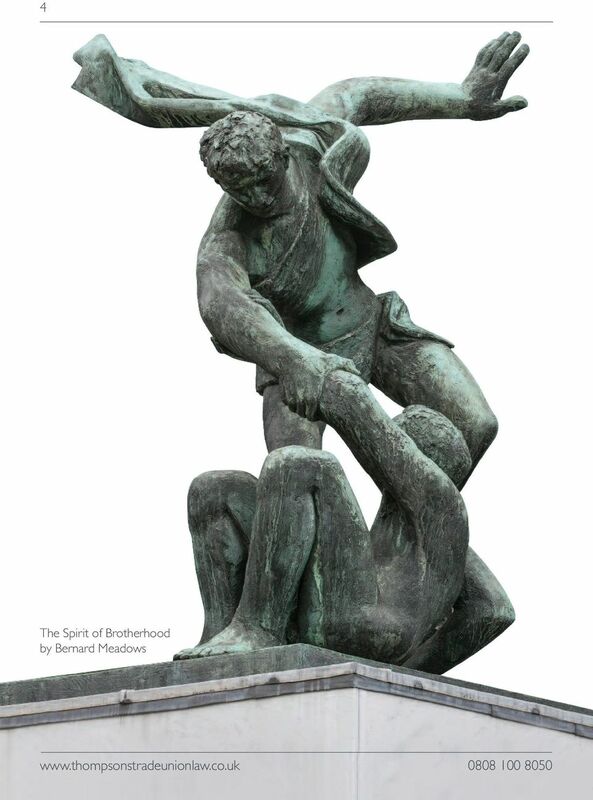 This consists of a general duty and specific duties. The general duty has three aims and requires public bodies to have due regard to the need to: Eliminate unlawful discrimination, harassment and victimisation and other conduct prohibited by the Act. Advance equality of opportunity between people from different groups. Foster good relations between people from different groups. The specific duties are designed to help public bodies comply with the general duty. Broadly these require specified public bodies to publish information on how the general duty is being met and to prepare and publish one or more equality objectives. The specific duties for devolved public authorities are different in England, Wales and Scotland. Trade unions should therefore check that the employer is complying accordingly. 9 Summary of the law on race discrimination 9 What does the Act outlaw? 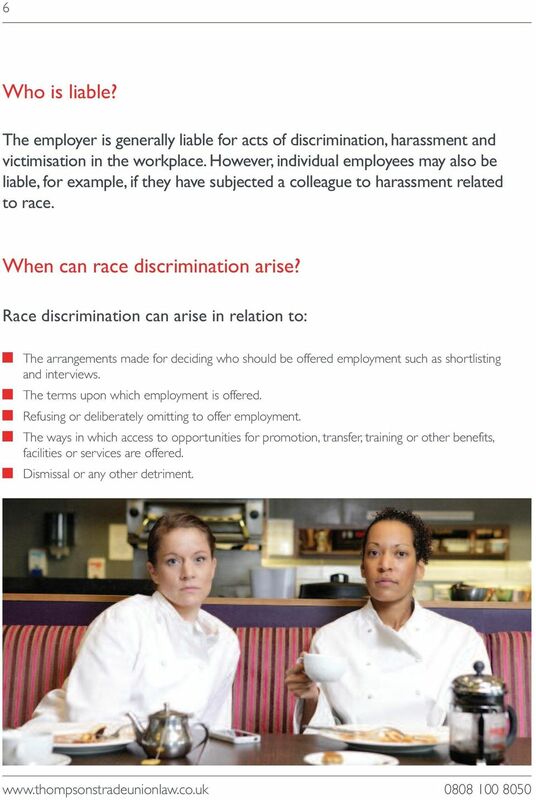 Direct discrimination This means treating a person less favourably than someone else because of race. In order to determine whether someone is directly discriminated against, a comparison has to be made with someone of a different race whose circumstances are the same or not materially different. The definition is wide enough to cover those who are also discriminated against because they are perceived to be of a particular race or because they are associated with someone of a particular race. 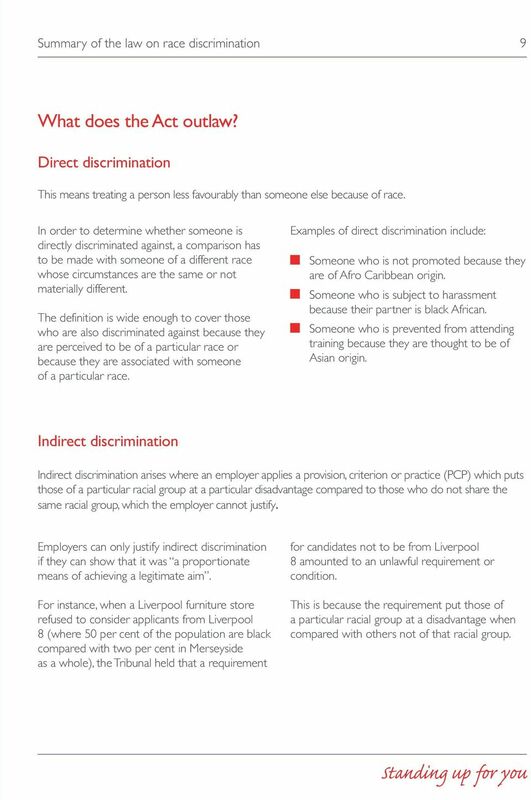 Examples of direct discrimination include: Someone who is not promoted because they are of Afro Caribbean origin. Someone who is subject to harassment because their partner is black African. Someone who is prevented from attending training because they are thought to be of Asian origin. Indirect discrimination Indirect discrimination arises where an employer applies a provision, criterion or practice (PCP) which puts those of a particular racial group at a particular disadvantage compared to those who do not share the same racial group, which the employer cannot justify. Employers can only justify indirect discrimination if they can show that it was a proportionate means of achieving a legitimate aim. For instance, when a Liverpool furniture store refused to consider applicants from Liverpool 8 (where 50 per cent of the population are black compared with two per cent in Merseyside as a whole), the Tribunal held that a requirement for candidates not to be from Liverpool 8 amounted to an unlawful requirement or condition. This is because the requirement put those of a particular racial group at a disadvantage when compared with others not of that racial group. 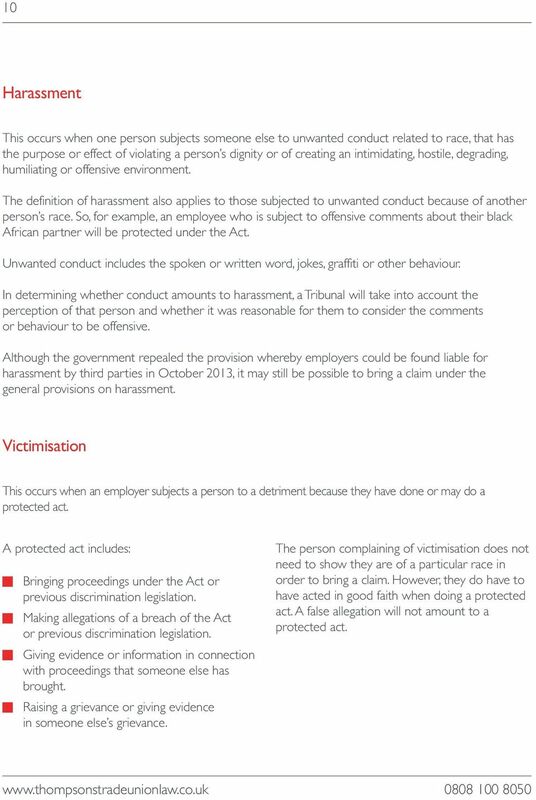 13 Summary of the law on race discrimination 13 How do claimants gather information from their employer? Workers can currently request information from their employer about their complaint. There are standard forms for asking and answering questions (the questionnaire procedure), as well as guidance which explains how the procedure works. 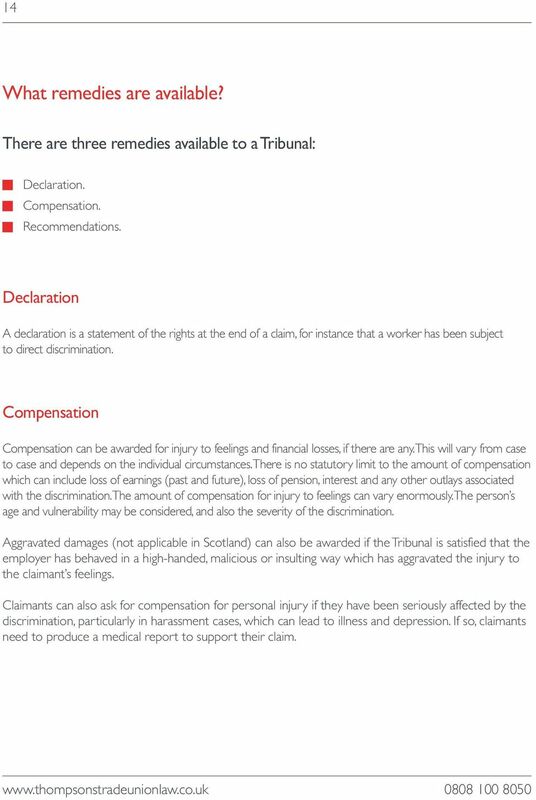 A questionnaire can be sent to the employer any time before a claim is lodged at the Tribunal or within 28 days of a Tribunal claim being lodged. If the employer fails to answer the questions within eight weeks, a Tribunal may use this fact to draw an inference of unlawful discrimination. However, the government has said it will remove this provision in spring It is important in most cases for claimants to submit a written grievance in order to comply with the ACAS code of practice on disciplinary and grievances. What time limits apply? 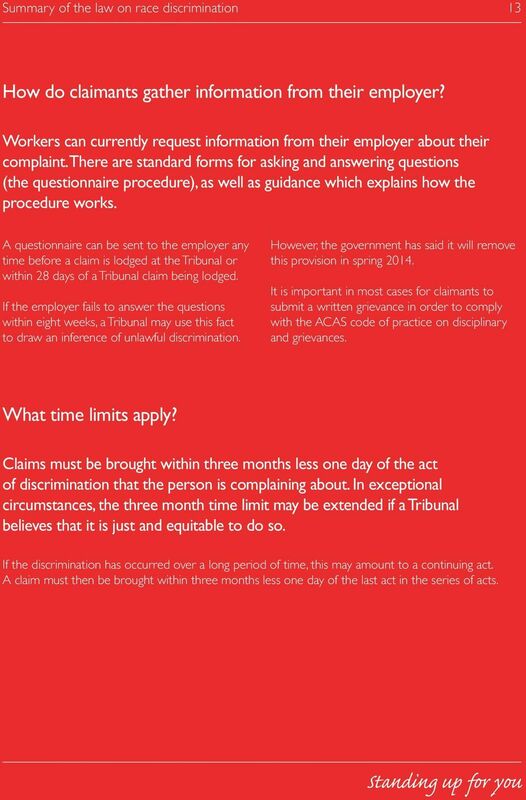 Claims must be brought within three months less one day of the act of discrimination that the person is complaining about. In exceptional circumstances, the three month time limit may be extended if a Tribunal believes that it is just and equitable to do so. If the discrimination has occurred over a long period of time, this may amount to a continuing act. A claim must then be brought within three months less one day of the last act in the series of acts. 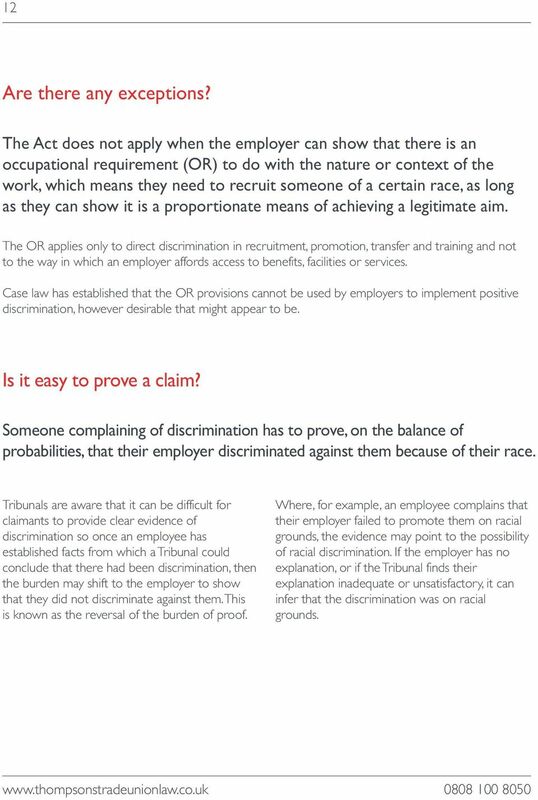 15 Summary of the law on race discrimination 15 Recommendations The Tribunal can make recommendations for the purpose of preventing or reducing the effect of the discrimination on the claimant or any other person even though they were not a party to the claim. Examples include requiring an employer to: Introduce an equal opportunities policy. Ensure their harassment policy is more effectively implemented. Set up a review panel to deal with equal opportunities and harassment/grievance procedures. Re-train staff. Make public the selection criteria used for the transfer or promotion of staff. 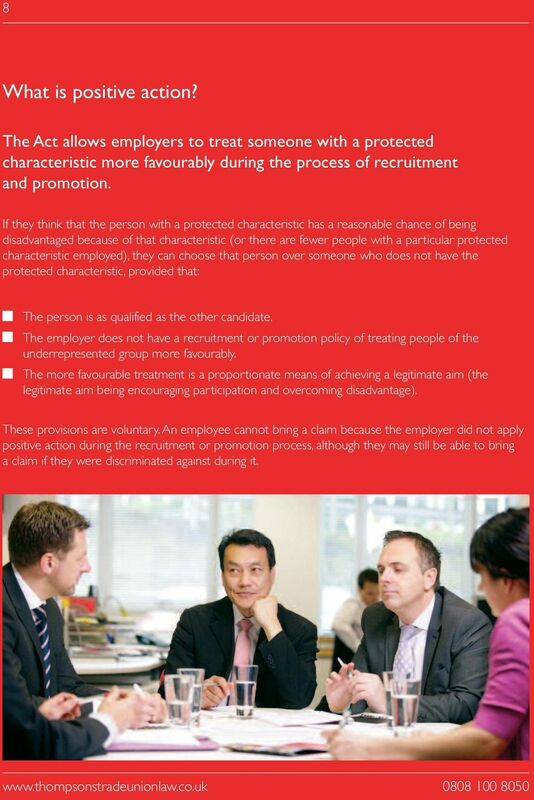 A Tribunal cannot recommend that a person be given a job in a case where an employee successfully claimed they were discriminated against in a promotion exercise, for example. 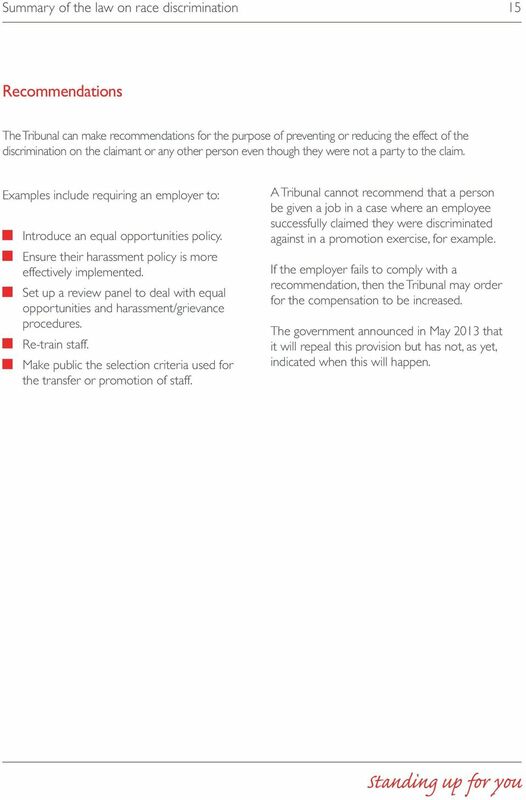 If the employer fails to comply with a recommendation, then the Tribunal may order for the compensation to be increased. The government announced in May 2013 that it will repeal this provision but has not, as yet, indicated when this will happen. Summary of the law on equal pay. 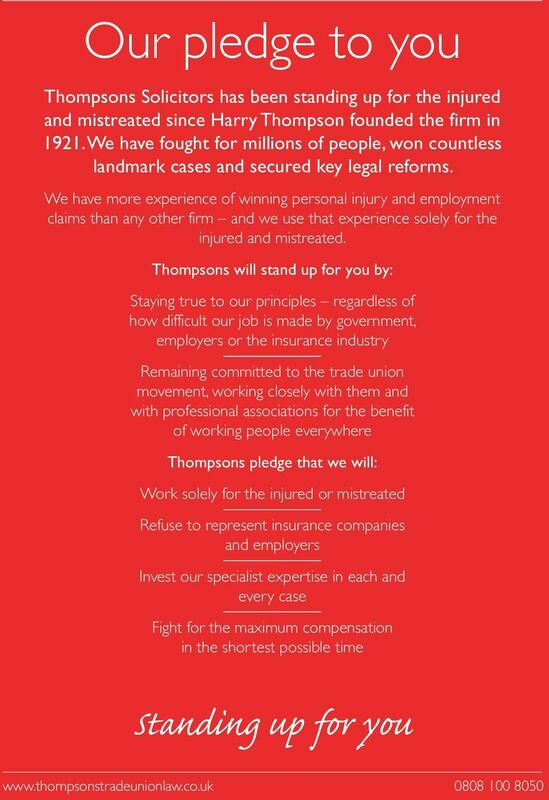 Summary of the law on equal pay www.thompsonstradeunionlaw.co.uk Our pledge to you Thompsons Solicitors has been standing up for the injured and mistreated since Harry Thompson founded the firm in 1921. 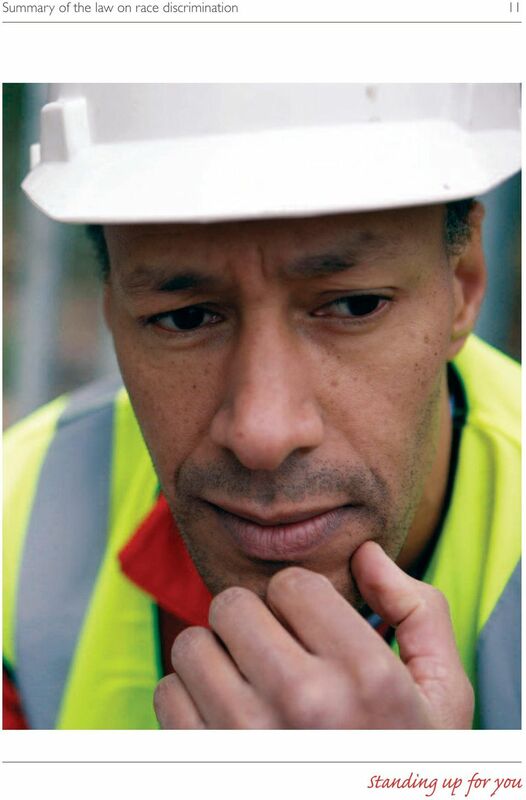 Protection from discrimination, harassment and victimisation when you re self-employed This information is an extract from the booklet Self-employment and cancer. You may find the full booklet helpful.